The good news: After decades of wondering whether this immaculately bearded monkey really existed, but not being able to confirm it because of never-ending violence in Colombia, scientists say they've finally found evidence of the Caqueta titi monkey. The bad news: Because of habitat destruction, the cat-sized redbeard primate is critically endangered. 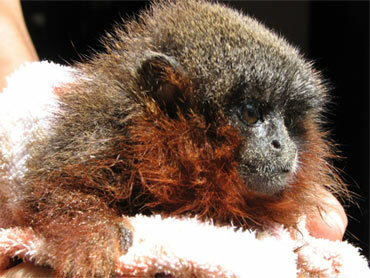 The new species joins about 20 other titi monkeys known in the Amazon basin. They appear to be monogamous to a level that puts humans to shame, says expedition leader Thomas Defler, whose study (pdf) appears in Primate Conservation. The Caqueta monkey couples have about one child per year that they raise together, and that isn't the end of their absurd adorableness. "All of the babies purr like cats too," Defler added. "When they feel very content they purr towards each other, and the ones we raised would purr to us." Defler got to make the trip to Colombia's Caqueta region because violence in the area had lessened by 2008, and because he met Javier Garcia, who is from there. Garcia hopes to keep studying the monkeys for his master's degree work-and to argue for new nature preserves to protect them and other endangered species. It is estimated that less than 250 Caquetá titi monkeys exist - a healthy population should be in the thousands. The main reason for this small number is the degradation of the forests in the area, which have been felled for agricultural land. It is very dangerous, and sometimes impossible, for these animals to move to other patches of forest as they have to cross grassy savannah or barbed wire fences to reach them.